Anyone know if it's possible to convert a scart to hdmi. I've got an old Wii which we still like playing with, but new TV doesn't have any scart inputs? You could always use a component cable. 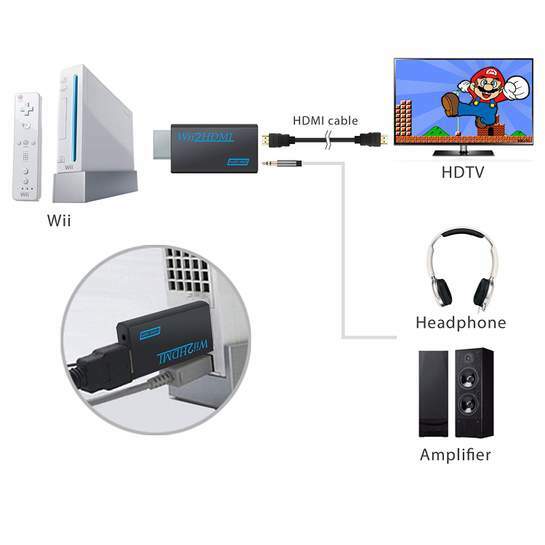 You can buy an adapter, specifically for the Wii, to convert it to hdmi. Thanks Hamster, sorry I'm not very techie, would it work on my tv? Thanks Jas, but link not working for me? Yes it mentions component in the specs. Sorry, messing about on my phone …Sorry, messing about on my phone amazon.co.uk/dp/B078Y58RN9/ref=cm_sw_r_cp_api_tzioBbX2D580ZThat better? Great, thank you, do I need to do anything with that audio 3.5 connection or is that just for headphones? Sorry been out all day. No it works fine, sound plays through tv as normal. I did the same for my niece’s Wii. Buy it from eBay. Spend £6 (+ 20% VAT) to get £3 cashback via topcashback (expires today). How’d u get on? Manage to find a solution? Yes thanks, got one on ebay, works great, thank you!